In 12-inch nonstick skillet, heat oil over medium-high heat. 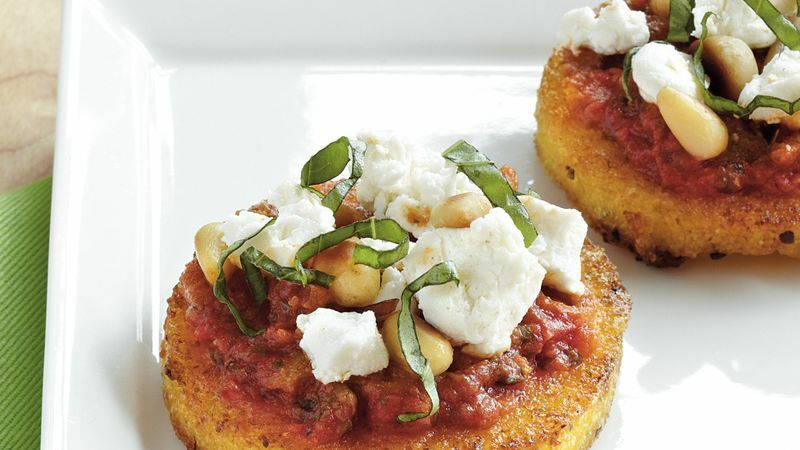 Add polenta slices; cook 12 minutes, turning once, until lightly browned and crisp. In small microwavable bowl, microwave pesto on Medium (50%) 1 minute or until thoroughly heated. Spread pesto evenly over polenta rounds. Sprinkle evenly with basil, cheese and pine nuts. Serve immediately. Look for rolls of polenta in the refrigerated dairy case. To ensure the polenta rounds are crisp, pat the slices with dry paper towels.